The Balloonatic Promotions is located in beautiful Orlando, Florida. The worlds number #1 vacation destination. 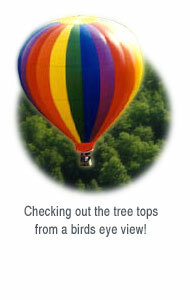 The Balloonatic Promotions is owned and operated by veteran pilot Ken Shumate. Ken has been flying hot air balloons for over 27 years and has logged over 2000 hours in the air. Ken is also a certified Flight Instructor and has trained over 45 new pilots. He has flown balloons of all sizes and shapes from the 2X Cloud Hopper models to the large 210,000 cubic foot 10 passenger balloons and special shape balloons like the United Van Lines truck balloon, the Brazilian Clown balloon and the Amazon Birds balloon. The Balloonatic Promotions puts it's emphasis on providing you a safe, fun and exciting adventure that you will remember for years to come. Our years of experience and spotless safety record will assure you of just that. Thanks for taking the time to find out about us. We hope you enjoy the web site and we look forward to hearing from you. If you have additional questions feel free to Contact Us .